A BASE jumper's dream job! Hey Pete, I could see you doing this! No, you won't see me up anywhere near there. 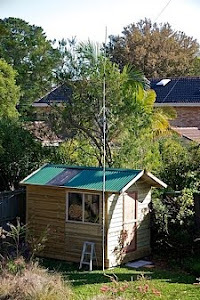 I hired a guy to put up my 6m pole on the roof here. Now that's just made my job look so insignificant! - and the free climb without safety ... eeek!